I realize it’s been a very long time since I’ve posted anything. It wasn’t my intention to be away for so long, and I don’t have a reason for the lack of updates. It just wasn’t something I was enthusiastic about doing and my last few projects weren’t documented particularly well. But I have been sewing, and I plan on doing a Progress Report soon to update you on all my WIPs and recently finished things. But in the mean time I want to post about something I started approximately 12 hours ago. I’ve been working on a relatively elaborate 18th century piece for the last little while, but injured my wrist last week which makes lacing the stays and doing fittings very difficult. So I decided to make something new this week. I wanted this to be something I could make quickly, not have to buy anything for, and could be worn over foundation garments I can currently get into. I also didn’t want to waste an expensive cut of silk or brocade since my “quick” projects aren’t always very well made. In the end I was loosely inspired by this painting and used this piece as my main reference for the dress design. I also took some inspiration from my favorite disney princess film Tangled – at least in terms of color scheme and period. 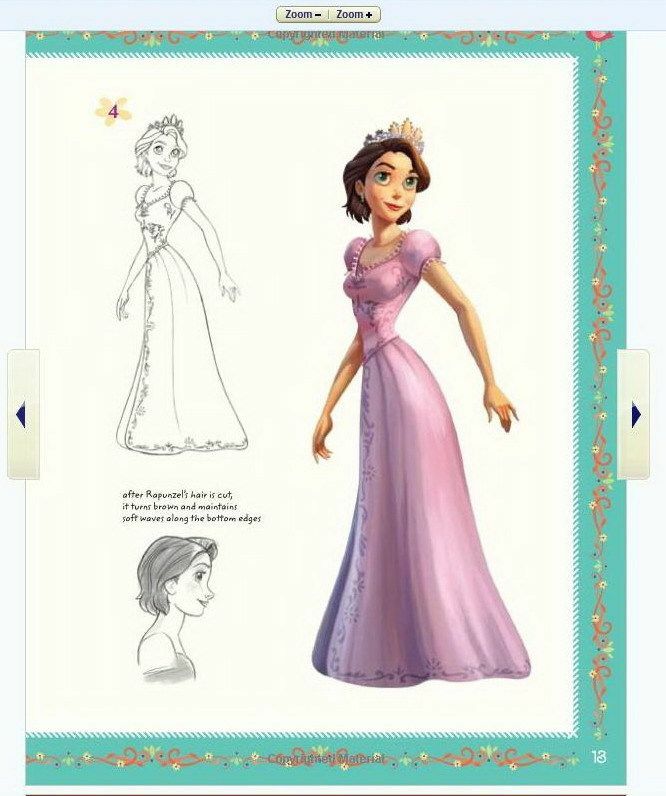 For those unfamiliar with the film, Rapunzel wears light purple gowns for both of her outfits, and her family crest is a golden sun. A while back I bought satin and a *stunning* glitter embossed mesh because it reminded me so much of her design. And this seemed like the perfect time to use it! The film is also supposed to take place in the first third of the 19th century, so with the 1820’s references I guess you could say this is my more historically accurate take on her ensemble. This material was from Hamed Fabrics in NYC, and was $8/yd. 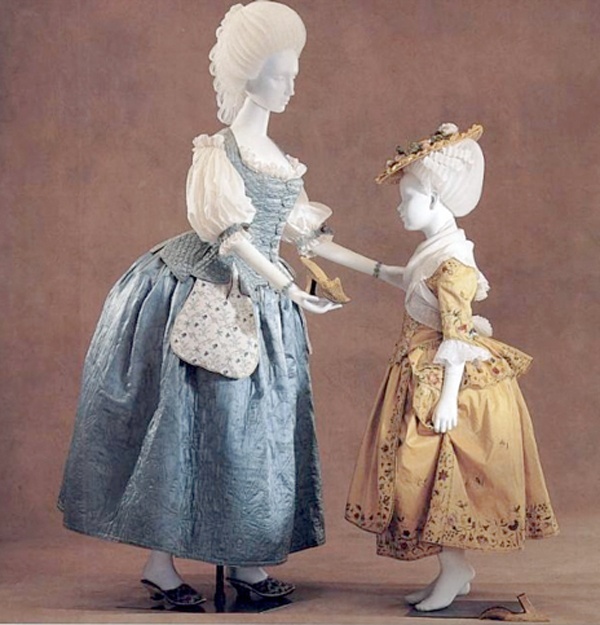 The glitter application and print actually reminds me a lot of the fabric used for the live action Belle dress (but prettier, in my opinion). I’d also like to incorporate this brooch which I bought for a dollar at an antique market. As per usual, my first step was draping the pattern. I did this out of cotton on my pinable form. Nothing very special about the design, though the neckline was kind of tricky. Very low and almost off the shoulder, but not quite! I drafted the back normally (rather than the exaggerated seaming seen in 1810 and the 1830s) with a separate shoulder strap. Then I transferred everything to paper and cut out a mock up. This fit surprisingly well! The straps and bust were a little loose, but that’s an easy fix. I also ended up adding a half inch to the neckline since I thought it would be a little low after seam allowances if I left it as it was! I dove right into cutting out the bodice. Everything was cut from once from satin (the top fabric) and again from cotton (the lining). I also cut out mesh to use as an overlay for the back panels and straps. The mesh overlay for the front panels was draped overtop of the pieces after they were sewn together. And here you can see that draping in action. I cut out a square I thought would be big enough for half of it, then pinned it until I was happy with it. I trimmed the edges, then removed it from the form and used it as a guide for cutting a matching piece for the other side. Here is the overlay after being trimmed. I sewed these pieces together at the centerfront with a half inch seam allowance, then trimmed the allowance down so it would be less noticeable. I pinned the overlay in place once again. I pinned it to the neckline and side seams first, then fiddled with the ruching at the center until I was happy with it. Eventually I decided there wasn’t enough fabric in the ruching…so I gathered it more than originally planned. Which is why there is a big gap of fabric at the bottom of the bodice. I will cover that with a glittery waistband later. Iremoved this from the dress form, then sewed around the overlay to secure it in place before removing any pins. Now I could sew the bodice together. It didn’t look like much at this point! I assembled the lining out of cotton, and sewed the seam allowance down to create boning channels. I pinned the bodice to the lining, with the right sides facing each other. Then sewed around the neckline to secure them together. Then the bodice was turned the right way out, and I tacked around the neckline. Now it looked much better! After a fitting I realize it was a bit too small. Luckily there was extra fabric in the center back edge, so I let it out by a half inch on either sides. Now the lining doesn’t match up with the back edge, but it’s better than the bodice not fitting! At this point I was going to add boning to all the seams…but I forgot to sew two of boning channels. And I tacked over the center boning channels when sewing the overlay in place. So boning was only added to the side seams and the back edge. Oops. The two dots of thread are where I tacked the overly to the under bust area. these dots, and some stitching down the center front are the only things that keep the pleating/gathering positioned. 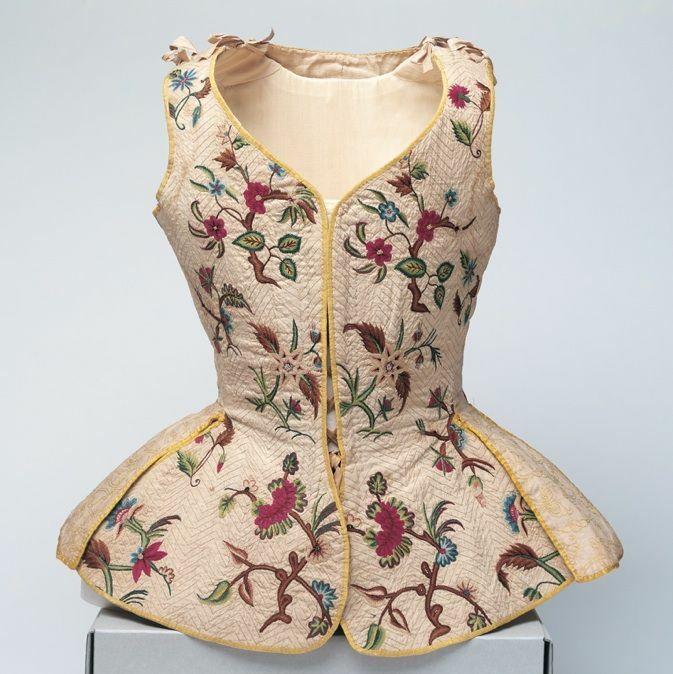 My plan was to cover the gathering point of the overlay with the brooch, but I came across several examples of banding at the center of 1830’s bodices. Some of these also included banding on the straps, which I thought was a clever way to widen the neckline and cover seams. I cut some 1.5″ wide strips of mesh, folded them in half, and sewed the raw edges together with a quarter inch seam. However I quickly discovered the mesh was too delicate to turn the right way out. So instead I tacked the strips so the seam allowance was at the back of the bands and not visible. Here they are in position. The middle one was secured by hand, and the ones on the straps will be held on by the same stitching that secures the sleeves. And that was it for day one of making this project! I’m going to use a sleeve pattern from another project, and the skirt will be a gathered rectangle. So if all goes according to plan I can wrap this up tomorrow.